When you have a potential client that visits your office or business premises for the first time, they notice all sorts of details about the surroundings, this happens consciously or otherwise, and they then form opinions on what they have seen. If however your office is fronted by happy and contented staff members, who work in a clean and tidy, well organised environment, the customer will gain a positive impression of your business and on how well it treats its staff and how it wishes to be perceived by its paying customers. A tidy work space thus implies a business which is thoroughly organised and conscious of its responsibilities. This is where we can help you, in keeping that environment clean, tidy and up to scratch. We can provide our services as a one off or as a Daily, Weekly or Monthly Contract. Our aim is to service your needs the way you want them dealt with. Whether your office is in Cornwall, Devon or Nationwide we can take good care of you cleaning needs. Even if you are part of a large group of companies we will remove the headache involved in managing all the different offices you may have nationwide. Just give us a call or send an email Click Here and we will take care of it all. What about the inside of your windows?. This sometimes gets forgotten when it comes to cleaning, but we can take good care of Window and Blind Cleaning. We will clean the inside of your windows and the window blinds if you have them. This will leave you with a clear view and a staff and customer friendly building. Floor cleaning services. We can take care of you floor buffing and cleaning for your office building. 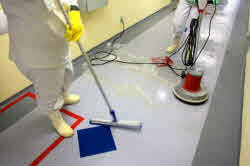 What ever you have as an office floor we can keep it clean and in pristine condition. Does your floor require buffing? then we can use our modern equipment to clean, polish and shine your office floors. Wooden floors, Carpeted floors, Stone floors it matters not, we clean them all. A high standard of washroom hygiene is in our opinion vital for good staff and customer wellbeing. The Janitorial and Washroom Services that we provide are second to none, although we could be biased. Our washroom services are designed to provide you with everything you need to keep your washrooms and toilet facilities looking good and staying hygienic. We provide janitorial services to a whole array of industries including Offices, property managers, retail stores, banks, schools, and industrial plants. Why not talk to us about how we can help you with your washroom and hygiene needs?. Give us a call or email Click Here and we will take care of the rest.